REVOLUTIONARY 360 WASH: Our ring design sprays water gently giving your dog a massage-like feeling which they will love! It washes your pets hard-to-reach areas without you having to lay your pet in a way they do not like, and without using your hands! SHAMPOO WASH: Our Pet Washer 360 is connected with a shampoo holder. With a press of a button, the soap and water instantly mix, creating a sudsy solution to scrub your pup clean, from head to tail. Your dog will be shampooed and rinsed in under one minute! BONUS: As a bonus, you get the Pet Washer 360 micro-fiber, quick-drying mit for FREE, to dry your pet even faster. 100% MONEY BACK GUARANTEE: Pet Washer 360 is built to last and comes with an unbeatable 1-year money-back guarantee. Don't miss this great offer! Order now! 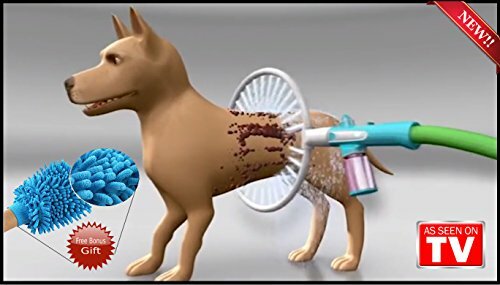 FINALLY, INTRODUCING THE REVOLUTIONARY PET WASHER 360 WHICH CLEANS YOUR PET COMPLETEY IN LESS THAN A MINUTE! ►Harsh washing methods which make your pet scared and run away? ►Trying hard to lay your pet in order to wash their bottoms and other hard to reach areas? ►Too less or too high pressure? Introducing Your Very Own Pet Washer 360 To The Rescue! YOUR PET WILL LOVE THE MASSAGING SPRAY! – Our ring design sprays water gently giving your dog a massage-like feeling which they will love! It washes your pets hard-to-reach areas without you having to lay your pet in a way they do not like, and without using your hands! – Washing your dog can be such a chore! You’ll love Pet Washer 360. Just connect Pet Washer 360 to your hose, add shampoo, slip the hoop over your pet and turn on. The soap and water instantly mix, creating a sudsy solution to scrub your pup clean, from head to tail. Your pet will be shampooed and rinsed in under one minute. The secret is in the 360 degree design that allows for a ring of water to jet gently around your pet for 360 degrees of clean. – Easily control the water pressure to your pet’s liking with the pressure control handle. – Pet Washer 360 comes in small or large so pets of all sizes can get 360 degrees of clean. The small Pet Washer 360 is for pets 25 pounds and under and the large is for pets over 25 pounds. – As a bonus, you get the Pet Washer 360 micro-fiber, quick-drying mit for FREE, to dry your pet even faster. – 100% MONEY BACK GUARANTEE: Pet Washer 360 is built to last and comes with an unbeatable 1-year money-back guarantee. Don’t miss this great offer! Order now! We Cannot Guarantee This Special Pricing, So Be Sure To Click Buy Now and try this amazing Pet Washer 360 RISK FREE ! !